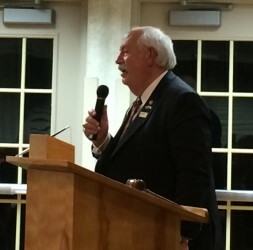 What a treat it was for us to attend a special event in Daytona Beach on Wednesday, October 19, when the Ormond By The Sea Lions Club hosted a dinner meeting at the Conklin Center with International President Chancellor Bob Corlew as the honored guest. It proved to be a wonderful event with many Lions from across Florida in attendance. 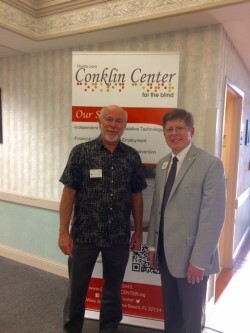 Since Lion Kathy and I had never been to the Conklin Center, we considered ourselves so fortunate to be in the historic place where tremendous efforts by dedicated professionals and volunteers alike provide education, training, support, and service for blind children and adult students with additional disabilities. 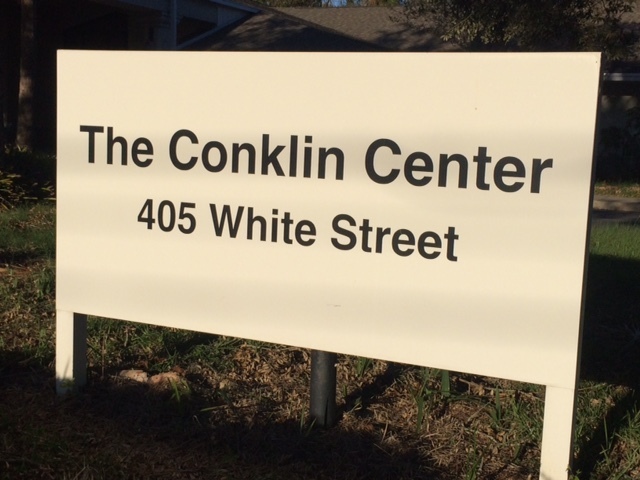 The Conklin Center is the only facility of its kind in the United States dedicated exclusively to the empowerment of blind students living with multiple physical challenges for employment and independence. Conklin Director Robert Kelly, who is a Lion, shared with us that the Center’s mission is to enable its students to become independent, active citizens. He proudly added that 85% of students who complete the program each year obtain jobs and continue their education and vocational training, therefore becoming more self-reliant. With support from Lions Clubs International as well as other agencies, the Conklin Center continues to serve its students with guidance and support long after their “graduation.” Another tremendous part of the Center’s role is the educational service for blind children from birth to age five who live across a four-county area in Florida. President Bob Corlew recognizes the efforts of local responders to help those in need following Hurricane Matthew. Fortunately, Hurricane Matthew only caused minimal damage to the Center. President Corlew toured the area from Gainesville over to the eastern coastal region and actually had to evacuate the hotel where he was staying in Daytona Beach when it was discovered that there were some lingering problems with water damage from the hurricane. 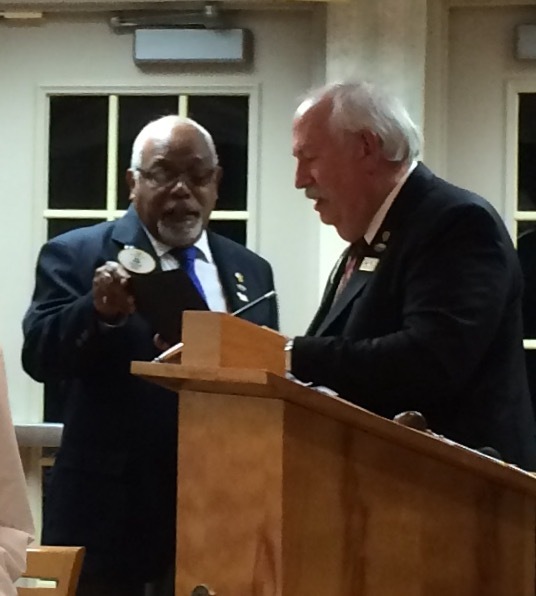 President Corlew presented a number of awards to central Florida Lions and he was presented a Life Membership from the Florida Lions Diabetes Foundation. A very inspirational induction for new member and his sponsor. 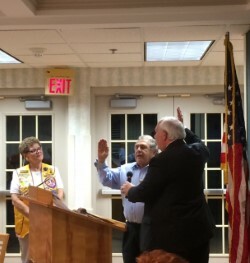 Another highlight was the induction of new member, Peter Caputo. District Governor Steve Hilaire and IP Bob Corlew collaborate on presentation of chevrons and awards to several deserving Lions. 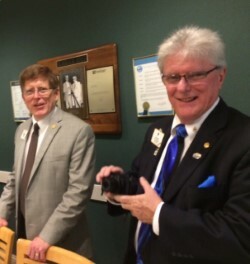 The presence of two Past International Directors–Lion Stacy Jones and Lion Neil Spencer–along with past and current district officers added to the festivities. PID Robert and PID Neil enjoy a moment following President Corlew’s remarks. President Corlew brought the Centennial Banner for all to sign that will be on display at the Centennial Convention in Chicago next summer. 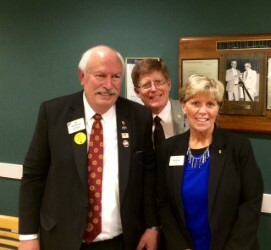 We enjoyed meeting Florida lions and look forward to the upcoming events in November. When we got on the road to our home in Oviedo, we reflected on the warm reception we received from the Florida Lions. What they say is true, Lions share a common bond where all are welcomed and appreciated for the service they provide. Thanks to all who serve those in need!